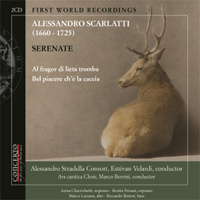 ALESSANDRO SCARLATTI (1660-1725): Al fragor di lieta tromba, Bel piacere ch’è la caccia. Description: Two serenatas, Al fragor... 34 min. with the characters Love, Peace and Providence and Bel piacere... 60 min, and featuring Diana, Venus and Love. Clamshell box with 100-page booklet of notes and texts. 2 CDs. Italian-English texts. Anna Chierichetti, Rosita Frisano (sopranos), Marco Lazzara (alto), Riccardo Ristori (bass), Ars cantica Choir, Alessandro Stradella Consort; Estévan Velardi. Need to register? Click here.